Singing babies will always bring smile to my face. Aside from the fact that they are cute, I also envy them because they can sing well at a very young age. I, myself, can’t even carry a tune right even if I practice a gazillion times that’s why I am envious of them. Watch this adorable baby girl sing “You are my sunshine” and you’ll understand what I was saying. 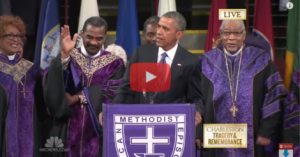 When Obama Did THIS At A Charleston Shooting Eulogy Service, My Heart Broke.